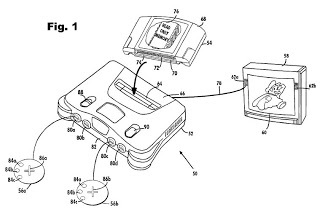 Issued December 18, 2001, to Nintendo Co. Ltd.
A video game system includes a game cartridge which is pluggably attached to a main console having a main processor, a 3D graphics generating coprocessor, expandable main memory and player controllers. A multifunctional peripheral processing subsystem external to the game microprocessor and coprocessor is described which executes commands for handling player controller input/output to thereby lessen the processing burden on the graphics processing subsystem. The video game methodology involves game level organization features, camera perspective or point of view control features, and a wide array of animation and character control features. The system changes the “camera” angle (i.e., the displayed point of view in the three-dimensional world) automatically based upon various conditions and in response to actuation of a plurality of distinct controller keys/buttons/switches, e.g., four “C” buttons in the exemplary embodiment. The control keys allow the user at any time to move in for a close up or pull back for a wide view or pan the camera to the right and left to change the apparent camera angle. 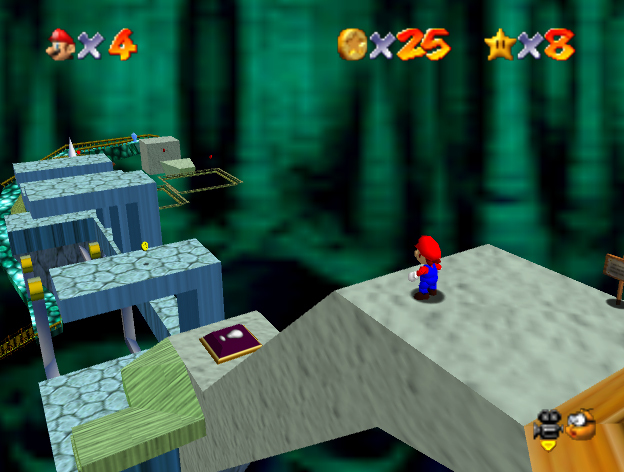 Such user initiated camera manipulation permits a player to better judge jumps or determine more precisely where an object is located in relation to the player controlled character. The video game system and methodology features a unique player controller, which permits control over a character’s exploration of the three-dimensional world to an unprecedented extent. A player controlled character may be controlled in a multitude of different ways utilizing the combination of the joystick and/or cross-switch and/or control keys and a wide range of animation effects are generated. preventing access to a third video game course if said cumulative total is below said predetermined threshold. Appeal Update & Decision: Fenner Investments Ltd. v. Microsoft et al.